July 25, 1865, dawned clear and warm, a typical summer’s day in rural Knox County, Ohio. The war had ended four months earlier, and this day promised the bounty of peace and the luxury of optimism. Trains arrived daily in Mount Vernon, the county seat, and brought Union soldiers – mostly from the Ohio 20th and 43rd regiments – home to warm welcomes. Local farmers looked hopefully at their fields. A writer for the Mount Vernon Democratic Banner rode ten miles from town and did not see “ a single poor field of grain, wheat, or rye.” The ears of corn had filled in, and the oats looked better than farmers could remember. Clover and flax fields lay rich in the summer heat. Wheat sold at $1.20 a bushel, rye at $.50, and oats at $.35. The local papers, no longer bordered in black to mourn President Lincoln’s death, could devote time and newsprint to the week’s most exciting event, the Wolff – Goldsmith nuptials. 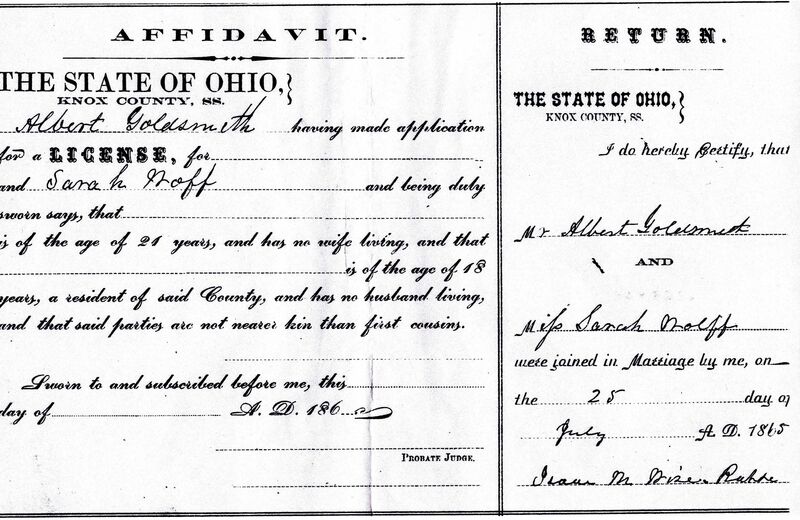 Affidavit for the marriage of Mount Vernon, Ohio, resident Sarah Wolff to Albert Goldsmith, 1865, signed by Rabbi Isaac Wise. Tuesday was a perfect day for a wedding and not just any wedding. The Banner observed that Christian weddings were so common that they merited little attention, but today’s ceremony would be “conducted according to the ancient rules of the Hebrew church.” The first Jewish wedding in Mount Vernon took place that evening at the bride’s home on East Gambier Street. Sarah Wolff, age twenty-one and the oldest of Adolph and Hannah Wolff’s six children, married Albert Goldsmith, a twenty-six year old traveling salesman from Cincinnati. Earlier that year, Albert Goldsmith had come to Mount Vernon and met Adolph Wolff. A salesman, Goldsmith would have stopped at all four clothiers in town, three of whom were Jewish. Adolph Wolff, his future father-in-law, occupied a prime site in the Woodward Building on the corner of Main Street and Vine; his brother-in-law Leopold Munk operated under the sign of the Lone Star on the west side of Main Street, and Marx (Max) Leopold of Leopold & Co. rented space in the Kenyon House, a block north of Wolff’s stand. Adolph Wolff arrived in Mount Vernon during the winter of 1846-1847. Born in Germany around 1819, he landed in New York in 1841 but moved to Cincinnati soon thereafter. He peddled around the Mechanicsburg area east of Columbus, Ohio for several years visiting the countryside with his packs probably filled with dry goods and notions before bringing his family to Knox County. A year after arriving in Mount Vernon, he opened the Queen City Clothing Store in the Kremlin Building on the corner of High Street and Main and advertised “the best cheap ready made clothing.” Within months, he dropped the Cincinnati reference in the store’s name and advertised simply as A. Wolff, clothier. Wolff’s business in Mount Vernon prospered over the next seventeen years. He moved his store to the Woodward Building and bought the Buckingham Building “one of the finest looking buildings in the city” at the corner of Main Street and Gambier Street. Twice a year he traveled to Cincinnati and the East to purchase fashionable “ ready-made clothing” and piece goods which were then sewn together and finished locally. Validating his business acumen, in 1861 Wolff paid $5,000 (about $125,000 today) for a grand house at 105 East Gambier Street. Wolff’s success reflected the growth and prosperity of his adopted county and hometown. Railroads connected Mount Vernon to Columbus, Cincinnati, Cleveland, Pittsburgh, and Chicago. The rails quickly brought goods to local merchants allowing one grocer to advertise fresh oranges and lemons in April. Downtown Mount Vernon had dry goods stores, clothiers, millinery shops, a book store, druggists, cabinet makers, carpenters, and joiners. The Woodward Opera House provided weekly entertainment, The Mount Vernon Woolen Factory had recently been established, and the Knox County Bank had reorganized under its new name the Knox County National Bank. Taking advantage of inexpensive iron and coal markets and plenty of railroads, the Mount Vernon Iron Works advertised circular saw mills and stationary and portable engines as did the Kokosing Iron Works. Kenyon College nested comfortably on a hill in nearby Gambier, Ohio. So when Albert Goldsmith, who had settled in Cincinnati a year earlier after immigrating from Germany, arrived in Mount Vernon, he saw a busy town proud of its past and optimistic about its future. He also found a small enclave of German Jews, lundsmen, in rural Ohio, a welcome from Adolph Wolff’s family, and a fiancée in Sarah Wolff. The Wolffs invited many guests. Family members included Sarah’s sister Ella, her four brothers, her aunt Caroline Wolff who lived with them, and her aunt and uncle Sophia and Leopold Munk who lived next door. Most of the town’s prominent citizens received invitations and attended. No guest list exists, and the local newspapers listed only a few attendees by name. Lecky Harper, the editor of the Mount Vernon Democratic Banner often referred to Wolff in his paper as his friend and neighbor; he surely attended. The rival newspaper, the Republican, wrote about the wedding, so William T. Bascom, the editor, probably witnessed the wedding. In 1866 Wolff would sell the Buckingham Building to George Potwin and buy the Kenyon House from R.C. Kirk; perhaps both men attended. Several Kenyon College professors rode the five miles from Gambier for the seven o’clock ceremony, and a host of local ministers, the only guests whose surnames were mentioned in the Republican, observed the rite. Guests from out of town, including the rabbi, arrived from Cincinnati. Perhaps Wolff’s young business competitor Max Leopold and his wife also attended. One of the few other Jewish families in town, they lived in the First Ward, directly east of town center and near the Wolffs. To prepare the Wolff house for the wedding, the family placed “fancy lanterns” around the yard and arranged tables and chairs under the shade trees. The Republican praised the abundance of food and drinks. The Mount Vernon Union Brass Band, advertising itself as reorganized and “in good healthy condition,” played selected songs from its repertoire. As evening approached a servant lit the gas lights to illuminate the house and assured that the “numerous, beautiful and costly” wedding gifts were on display. Perhaps Polly, a parrot the Wolffs had been given twenty-five years earlier, was moved from the front room. Anyone walking along Gambier Street that evening would have been impressed with the guests, music, and lights coming from the home on the north side of the street. Undoubtedly, the presence of the Cincinnati rabbi in Mount Vernon made the special evening more impressive because that rabbi was Isaac M. Wise. Although Wise’s greatest accomplishments lay in the future, by 1865 he had led the premier Reform congregation Bene Yeshuren in Cincinnati for eleven years and had created the Minhag America, a prayer book that reflected the changes he thought necessary to modernize the liturgy and reflect the beliefs of Reform Jews. And in 1865 Rabbi Wise was in Mount Vernon to perform a wedding. Both local newspapers wrote about the event, but neither mentioned the actual ceremony. Rabbi Wise conducted portions of the wedding in English because the Banner commented upon his “deeply affecting and eloquent” words. The Rabbi probably stood in front of a small table that held wine and a goblet for kiddush, the blessing of the wine. The groom gave his bride a ring, and then the rabbi recited the traditional seven blessings. There is no way of knowing what other Jewish wedding rituals were included. The bride looked beautiful; the groom was happy. Sometime after seven o’clock, the ceremony ended. The house aglow, the Union Brass Band played “popular airs” and entertained with “really first class music.” Excellent food, drink, and conversation greeted the guests as they strolled outside to enjoy any breezes on the warm July evening. The Rabbi mingled with the guests, and at one point the Methodist minister G.W. Bush, Dwight Hervey from the Presbyterian Church, Thomas E. Monroe from the Congregational Church, and two Episcopal ministers, James Muenscher and George Reece engaged Wise in a lively discussion on “Biblical matters.” Wise must have held his own because the Republican wrote, “We were very much pleased with Rabbi Wise.” The Banner praised both the town’s and the host’s hospitality. Surely the father of the bride looked about and took pride in his accomplishments and largesse. The Banner penned the perfect blessing for the evening. Expressing the hope that the young couple would have a long, happy life, he asked that “heaven’s richest blessings. . . ever be poured upon their heads.” Tragically, this was not to be. A year and five days after her wedding, Sarah Wolff Goldsmith died at the age of twenty-two from complications during her pregnancy. She was buried in a Jewish cemetery in Cincinnati. Her family stayed in Mount Vernon, and when her sister Ella later married and had a daughter, she named her Sarah. Wolff’s business continued to grow, and he would enjoy both his greatest success and his greatest failure in the next decade. Note: All quotations are from contemporary Mount Vernon, Ohio, newspapers the Democratic Banner, July 29, 1865, and the Republican, August 1, 1865.